Soros, a Hungarian-American Holocaust survivor, former hedge fund manager and billionaire Democratic donor, is a long-time bogeyman for right wingers, who see him as a Democratic puppetmaster who funds left-wing protesters and sponsors “invasions” of non-white immigrants and refugees. Many antisemitic conspiracy theorists, like the synagogue shooter, see Soros as the manifestation of a Jewish cabal that secretly controls the world. While the pervasiveness of money in politics and the ability of the wealthy to buy political influence is certainly a major problem in the US, singling out Soros as a conspiratorial paymaster is an obvious antisemitic dogwhistle, employed across the world by far-right politicians like Hungarian Prime Minister Viktor Orban and Polish ruling party leader Jarosław Kaczyński. 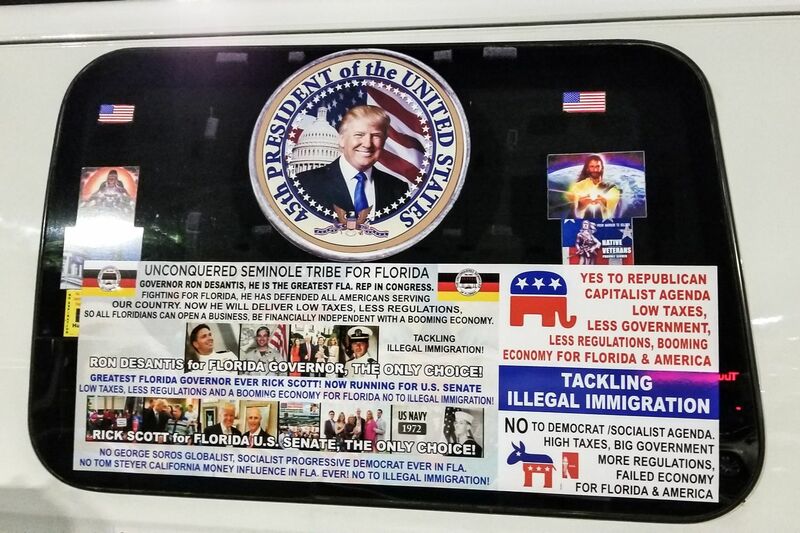 The Florida mail bomber, a fanatical Trump supporter, holds similar views regarding Soros. He made numerous social media posts that accused Soros of controlling Florida gubernatorial candidate Andrew Gillum (potentially Florida’s first black governor) and financially supporting David Hogg, a survivor of the February mass shooting in Parkland, who the bomber and many other conspiracy theorists like Alex Jones believe to be a “crisis actor.” The Kentucky shooter also had a social media profile rife with far-right memes and posts focused on such Soros- and caravan-related conspiracies, among others. After the bombing attempts, some right-wing pundits like Rush Limbaugh and Ann Coulter jumped straight for more conspiracy, calling the bombs “false flags.” Such blame-deflecting conspiracy theories are regular operating protocol for the right. Their media outlets and websites do their best to fan paranoid fears of America (by which they mean white people) being overrun by various threatening Others, which are frequently immigrants, refugees, Muslims, trans people, African-Americans or Jews. Due to its massive reach as the most popular cable news network and its hold on the president’s eyeballs, Fox News looms the largest in this conspiratorial bubble. To go over all of the racist, antisemitic, misogynistic and homophobic lies yelled on Fox News would take an eternity, but a couple recent hits drive the point home. Last Thursday, Lou Dobbs guest Chris Farrell of Judicial Watch said that the refugee march was under the influence of the “Soros-occupied State Department.” (Fear of an all-seeing “Zionist Occupied Government,” or ZOG, is a common theme in antisemitic conspiracy theories). Last month, Tucker Carlson went on one of his many dogwhistling racist rants, decrying diversity and the mixing of races. The day before Trump tweeted about Middle Easterners in the refugee march, the president’s favorite show, Fox & Friends, broadcast an interview where Judicial Watch head Tom Fillon falsely claimed that Guatemala had become a “way station” for terrorists. Hoax meme depicting Holocaust survivor George Soros as a Nazi. While other outlets like Breitbart, the Daily Caller and Glenn Beck’s The Blazeeach do their part in spreading lies and irrational fear, they are of course helped along by the rapid proliferation of fake and photoshopped right-wing memes that spread like wildfire on social media platforms like Reddit, Facebook and Twitter, who are often too slow in mitigating false claims, or not interested in correcting them. 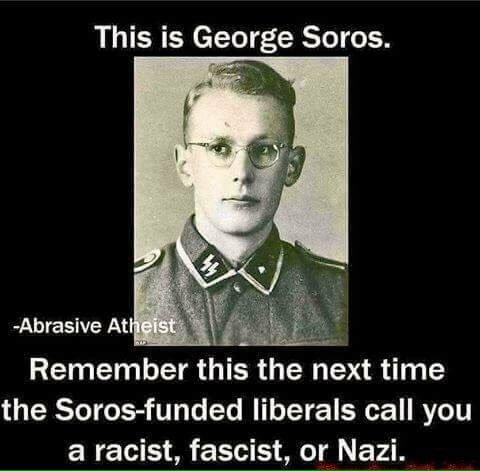 For example, a tweet that displayed a well-known fake meme that falsely identified a picture of SS member Oskar Groning as a young George Soros was retweeted over 6,000 times, yet Twitter took five days after it was reported to remove the post and suspend the poster. The damage had already been done. Racist and antisemitic conspiracies have long been a part of the far-right fringes. Yet fears of threatening invasion of black and brown people such as the Soros migration conspiracy and similar paranoia regarding the influence of (Jewish) Democratic donors like Tom Steyer have become accepted as fact by Republican Party politicians. Fox News addict Donald Trump is the most obvious: Last week he dropped the pretense of racist dog-whistles when he repeated the Fox & Friends claim that many “Middle Easterners” were a part of the caravan. Other prominent GOP politicians continue to publicly encourage these conspiracies, including House Majority Leader Kevin McCarthy, Iowa Sen. Chuck Grassley, Florida candidate for governor Ron DeSantis, Florida Rep. Matt Gaetz, Iowa Rep. Steve King and Arizona Rep. Paul Gosar, among many others. Of the mail bomber, Trump press secretary Sarah Huckabee Sanders maintainedthat “the president is certainly not responsible for sending suspicious packages, no more than Bernie Sanders was for a supporter of his shooting up a baseball practice,” referring to the shooting of Louisiana Rep. Steve Scalise last year. Obviously Trump isn’t responsible for sending the bombs themselves, but unlike Bernie Sanders, the president employs rhetoric that both explicitly and implicitly advocates violence and imprisonment against his political opponents, minority groups and the press. 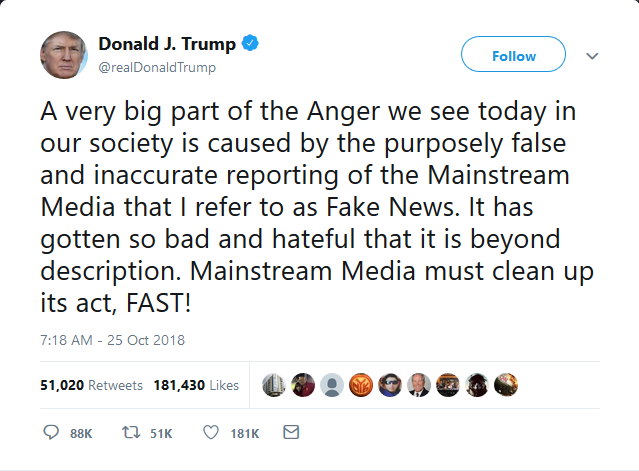 The president himself tweeted after the bombings that the “false and inaccurate” reporting by the mainstream media was to blame for the attacks, and later attacked Tom Steyer, one of the bomb recipients. Yet the political violence whipped up by the president, the GOP and their media apparatuses last week was treated by many in corporate media as just one shot in an ongoing duel between equally violent left and right extremist fringes. 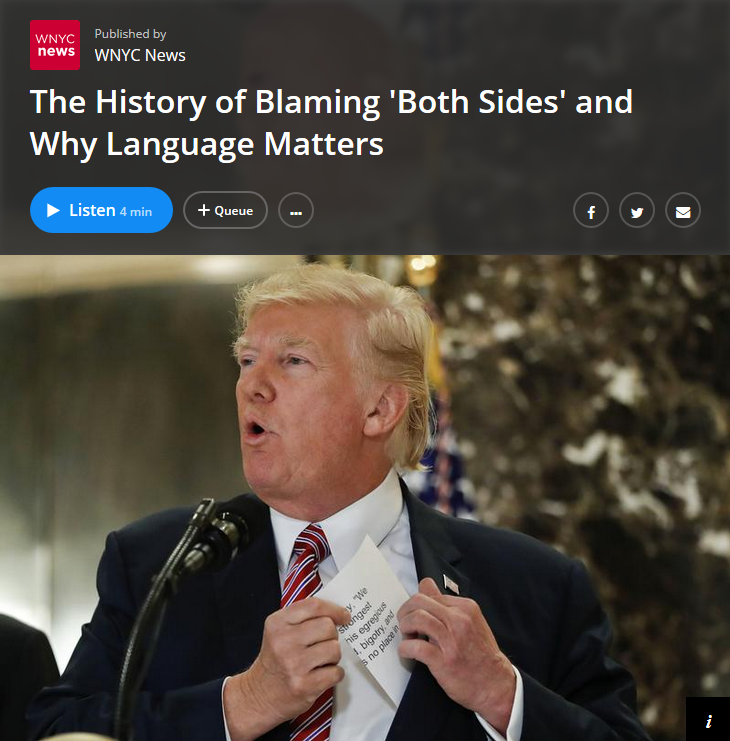 While this blatantly false both sides–ism runs contrary to actual facts, and plays right into the hands of an increasingly fascist right wing, it just won’t go away as a media talking point. Firstly, when comparing recent death tolls from political violence perpetrated by the two sides (communist, anarchist, environmental rights and black nationalist groups on the left, with the varied strands of white supremacist and Christian theocratic groups on the right), as well as deaths inflicted by Islamist extremism, the data is quite clear. In the past decade, right-wing domestic extremism claimed 71 percent of deaths, compared with just 3 percent for left-wing extremists, with the remaining 26 percent attributed to Islamist extremism, according the Anti-Defamation League. The only year in the past decade when right-wing extremism did not top the other strands was 2016, a result of the mass shooting at Pulse Nightclub in Orlando by a self-proclaimed member of ISIS, which claimed the lives of 49 people. Clearly, left-wing violence is near nonexistent when compared to the rising levels of right-wing extremism or the rising levels of antisemitic violence. It’s not like we didn’t see this coming: In the early years of the Obama administration, Homeland Security Secretary Janet Napolitano was browbeaten by prominent conservatives and right-wing media figures such as Eli Lake to downplay a shift in the agency’s funding and focus towards right-wing extremist terrorism after the leak of a DHS study that detailed its increasing threat. Don’t blame Donald Trump, Hugh Hewitt (Washington Post, 10/28/18) means–though Trump has constantly called for violence at his rallies. 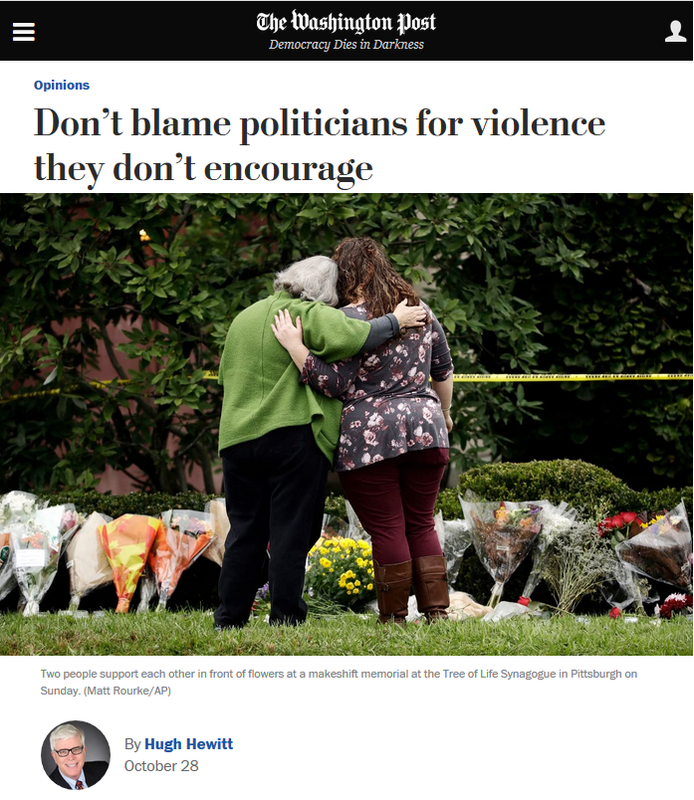 Yet the day after the synagogue shooting, Hugh Hewitt lamented in the Washington Post (10/28/18) that violent acts are regularly perpetrated by both sides of the political divide. Hewitt grouped political harassment in the same basket as political violence, and equated the “moron” who interrupted Mitch McConnell’s dinner and the “mobs” that harassed Texas Sen. Ted Cruz, Trump advisor Stephen Miller and Homeland Security Secretary Kristjen Nielson with attempted political assassins and bloodthirsty antisemitic conspiracists. This sort of whataboutism provides necessary cover for Republicans who commit politically unpopular acts, such as orphaning and imprisoning migrant children, from being confronted by their constituents. Hewitt argued President Trump and other Republicans should not be held in contempt for potentially inciting violent acts. He maintains that determining “incitement” is a slippery slope for free speech, and that responsibility lies “with criminals, not convenient political targets.” But did Hewitt consider the slippery slope of determining “incitement” when he supported the 2011 extrajudicial killing of Muslim cleric Anwar al-Awlaki, a US citizen who used his Internet videos to preach radical jihadism? Current US laws regarding “incitement” are indeed quite selective and frequently arbitrary. A recent court case, Nwanguma v. Trump, absolved Trump of legal responsibility for inciting violence at one of his rallies; by contrast, inciting what could be constituted as a “riot” is illegal. 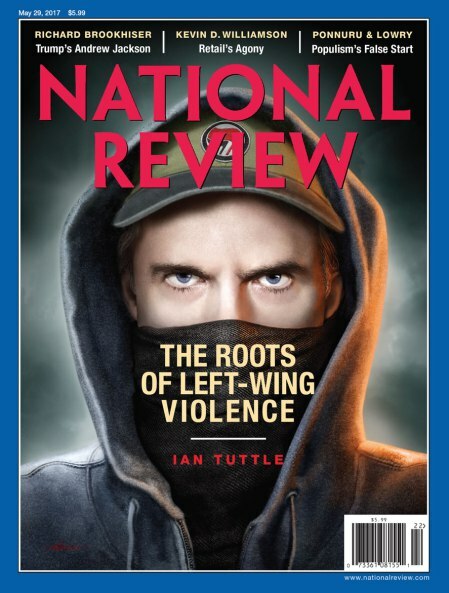 The National Review (5/29/17) focuses on the 3 percent of political violence that comes from the left to distract from the 71 percent coming from the right. The New York Times (10/26/18) ran a story that began with victim-blaming some of the bombing targets by highlighting their negative comments toward Trump, as if that justified an assassination attempt against them. On Monday’s episode of The View (10/29/18), Meghan McCain invoked the weak past affiliation of Minnesota Rep. Keith Ellison with Louis Farrakhan, the head of the Nation of Islam and a prominent antisemite, as proof that the left is just as culpable for political violence as the right. While Farrakhan is indeed an antisemite, a homophobe and a misogynist, his 10,000-member Nation of Islam has been politically irrelevant for decades, and Farrakhan hardly has the reach and power of Trump or other Republican politicians and media figures who reach tens of millions daily. Placing Farrakhan on the political left also ignores the fact that Farrakhan endorsed Trump. McCain, who once described dinner interruptions by protesters as “extremely dangerous,” is a bit disingenuous in her criticism; in the past, she has pushed conspiracy theories about sanctuary cities, while The Federalist, the right-wing news outlet run by her husband Ben Domenech, is a frequent publisher of conspiracy theories. On NBC’s Meet the Press (10/28/18), Chuck Todd brought on conservative blogger Erick Erickson to speak about the bombings and shootings of the previous week. Erickson castigated “the American people as a whole” for the volatile political situation, stating that Trump alone should not be blamed for the attacks. Todd failed to disclose that Erickson is a frequent promoter of conspiracy theories, including that of the refugee caravan and David Hogg. After he followed up speaking with Erickson, Todd brought on Ohio representative and GOP campaign chair Steve Stivers. Stivers lamented that Americans need to “keep their dialogue civil,” saying that he “hasn’t been shy about showing moral leadership.” However, Stivers has aired scores of scaremongering Soros ads for Republican politicians in advance of the midterms. While Todd did bring up this point, he did not press Stivers further on the Soros ads, which the GOP continues to aireven after the bombing attempts and the synagogue shooting. Even prominent Democratic politicians fell into the trap of both sides-ism and fetishizing civility. The day after Soros’s house was targeted by the bomber, Senate minority leader Chuck Schumer interjected on Twitter that attempted political assassination was commensurate with some vandals throwing a rock through the office window of California Republican Rep. Kevin McCarthy. Such misguided calls for civility and both sides-ism have long been a ubiquitous part of the media. Antifa, the anti-fascist movement that frequently protests against racist speakers at college campuses, has become the primary boogeyman for members of both the right-wing media bubble, as well as corporate media hell bent on maintaining a respectful discourse with neo-Nazis. There is no shortage of pieces in the mainstream media condemning such heavy–handed tactics as just as bad as the violent means used by the right. What those critics fail to understand is that conspiratorial, racist Nazis never went away after being defeated in thoughtful debate. Historian Kevin Kruse (WNYC, 8/16/17) recalls how denouncing “extremists on both sides” was a bipartisan practice during the Civil Rights Era. This “both sides” narrative also has historical precedent. As historian Kevin Kruse explains, during the years of segregation, the media’s tactics of calling for “civility” in political discourse and crafting a narrative of false equivalence between the KKK and the NAACP served to suppress racial integration and slow down the push for civil rights and equality for African-Americans. Such narratives are instructive for today. When the Washington Post editorial board or commentators like Chris Cillizza and David Axelrod of CNN decry activists’ loud interruptions of Republican politicians as they eat fancy dinners, or deny that US politics are at a “special moment justifying incivility,” they implicitly support the powers that be. At present, those powers are a fundamentally unpopular, unrepresentative and democratically illegitimate Republican president, House, Senate and Supreme Court. When vast sums of legalized bribery and corporate influence-peddling, the Electoral College, the antidemocratic structure of the Senate, partisan gerrymandering, voter suppression and other systems and tactics sap many people, especially minorities, of their ability to affect change at the ballot box, they will naturally and necessarily turn to means outside of the electoral system. Calling for misguided civility and unity only serves the status quo, which for most people in the US is not ideal. Judging by the recent spate of right-wing violence over the past two weeks, it would seem reasonable to conclude that regardless of the mail bomber and shooters’ questionable mental stability, each was helped along by the violent and racist conspiratorial rhetoric peddled by members of the insular right-wing online and cable news media bubble, and the demagogic Republican politicians who continually and purposefully parrot the same lies. The spotlight should not be taken off of Trump, who lest we forget jump-started his political success by headlining the racist conspiracy theory that President Barack Obama was born in Kenya. If the media actually want to oppose Trump, perhaps they could stop propping up narratives that provide cover for Trump supporters who commit violence.